Respected Parents, This is to inform you all that Final P.T.M + Annual Result will be on Saturday, 23rd February 2019. (11 A.M. - 4 P.M.)Regular classes of New Session will be started on Monday 4th March 2019, However The Campus Admin & Account Office will remain open As Per Normal Official Timings (8 A.m - 3 P.M). (For Staff Members) Thanking You, Regards, Admin, The Smart School City Campus Sheikhupura. We Are Building "A Smarter Pakistan" , We Are "The Smart School"
Respected Parents! The School Timing will be as follows from Monday 1st April 2019. Monday To Thursday: Class PlayGroup: 8: 10 am. – 11:30 pm. Class Nursery, Kindergarten:7: 50 am. – 12:30 pm. Class One – Tenth: 7: 50 am. – 1: 25 pm. On Friday: Class PlayGroup: 8:10 am. – 11: 20 pm. Class Nursery – Tenth: 7:50 am. – 11: 50 pm. Regards. Admin The Smart School City Campus Sheikhupura. Assalam-o-Alaikum ! By The Grace of Allah The Smart School City Campus Sheikhupura is Offering & introduced Online Educational Resources & Tools for Our Class Play Group to Matric Students. Admissions Open , Learn With Fun @ The Smart Schools. 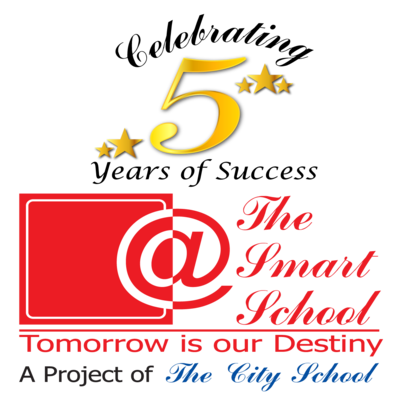 Thanks & Regards The Smart School City Campus Sheikhupura.